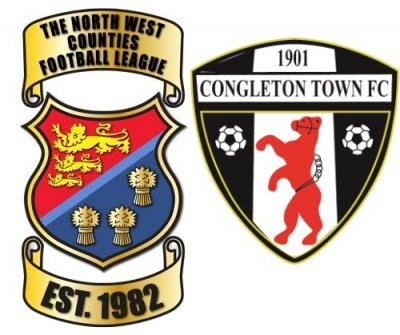 CONGLETON TOWN FC was formed in 1901 and for the first 80 or so years of their history, they played in local Cheshire leagues. 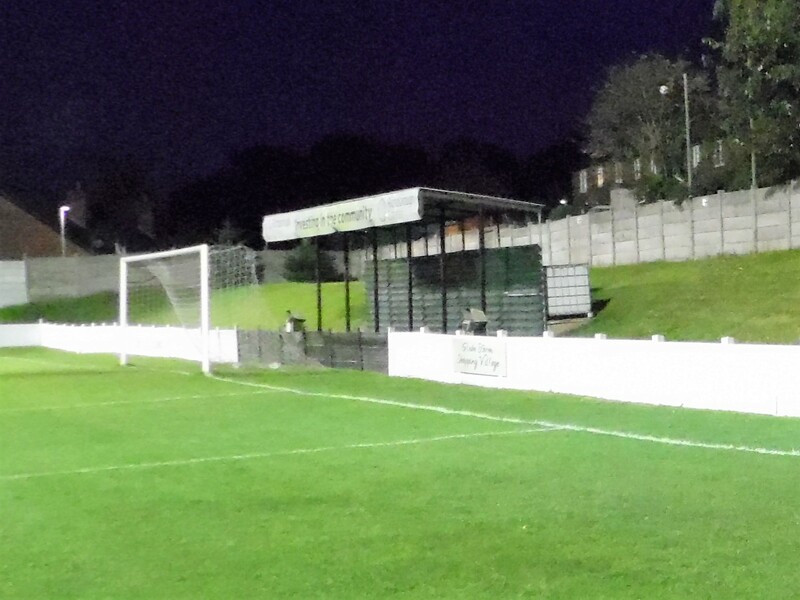 in 1982 they were founder members of the North West Counties League. 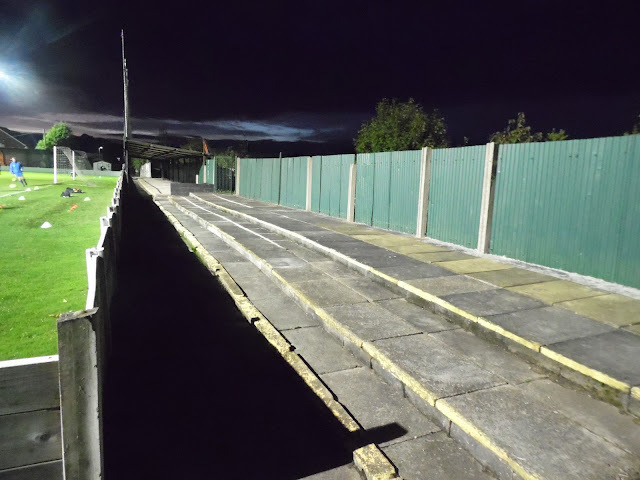 After a series of top half finishes, including a runners-up spot behind Clitheroe in 1986, they left the following year to join the Northern Premier League's newly created Division 1. 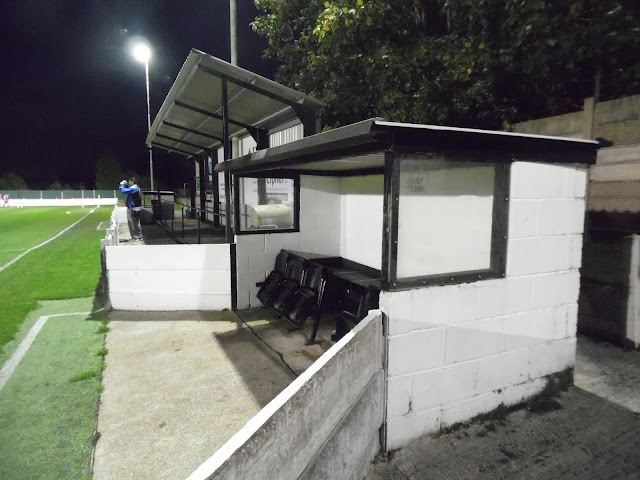 A best ever placing of 6th came in 1990, but the turn of the century saw them struggle and after a bottom-placed finish in 2001 saw them return to the North West Counties League. Their best placing since returning was 4th in 2009 and prior to tonight's game, they were sitting in mid-table. 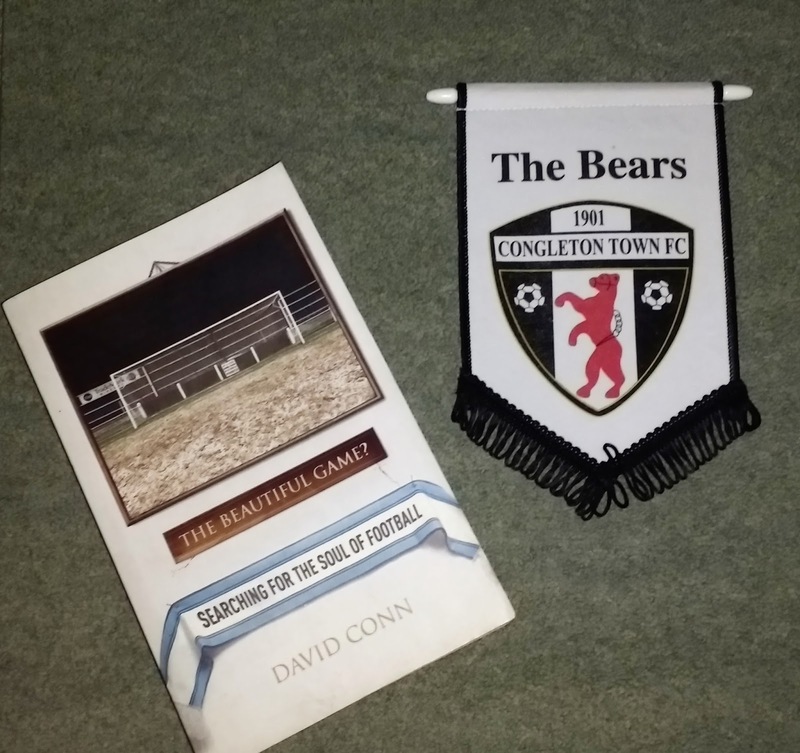 In the FA Cup, Congleton reached the 1st Round in the 1989/90 season. After defeating Irlam Town, Denaby United, Caernarfon Town, Colwyn Bay and Witton Albion, they faced Football League side Crewe Alexandra at Gresty Road where they lost 2-0. 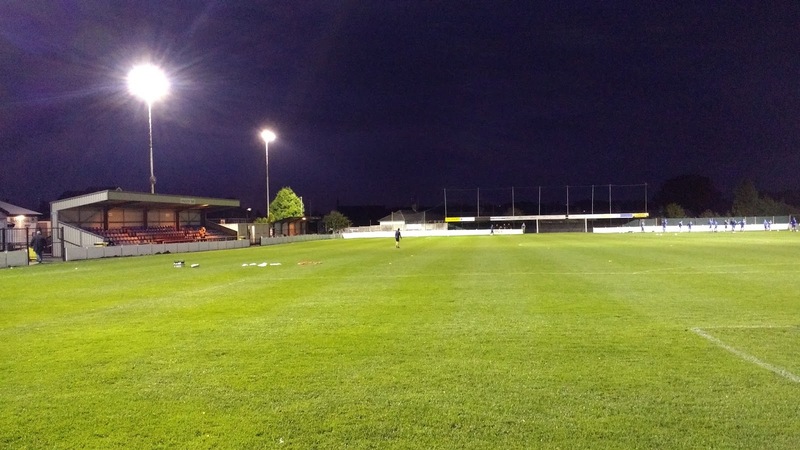 Despite being relegated in 2000/01 season, the club had an excellent FA Trophy run, reaching the 4th Round before a 6-2 defeat to Worksop Town brought an end to a run that had seen them have a nice distraction from their league woes. They went one round better in the FA Vase a few years later before a defeat to AFC Sudbury. Local Cup honours include the Cheshire Senior Cup, Cheshire Amateur Cup, Cheshire Saturday Cup and Crewe Cup. The clubs record attendance of 7000 came in 1953/54 when they hosted Macclesfield Town. Notable people to hail from Congleton include former Manchester City defender Ian Brightwell, veteran keeper Brian Jensen and current Liverpool and England striker Daniel Sturridge. It was my week off and on this day, I'd really been hoping to do an FA Cup game. Only one replay came out though and although it was one that I'd wanted to visit for ages, in Ossett Town, who were playing 1874 Northwich, I couldn't persuade my fellow hoppers to come. Chris was busy as he normally is on Tuesdays and Saturdays and Anwar didn't want to travel so far, even though I offered him a cheap deal on fuel costs. With the huge costs of fuel and the only nearby accommodation that was reasonably priced being a poky little room I had stayed in before, it was always going to be a long shot that I'd be going there. 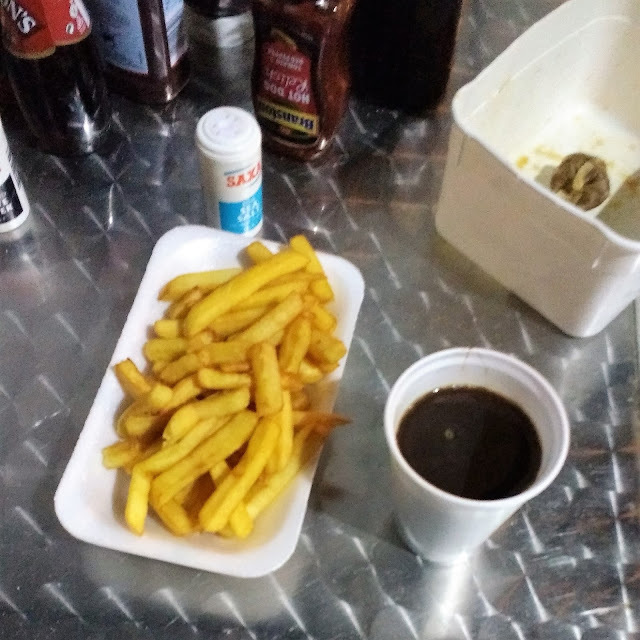 I'd recently blown well over £500, two weeks wages, on my last fortnight off and with the Western Hop coming up, I was trying to keep costs down. In any case, I'd decide on Sunday when the non-league paper came out. 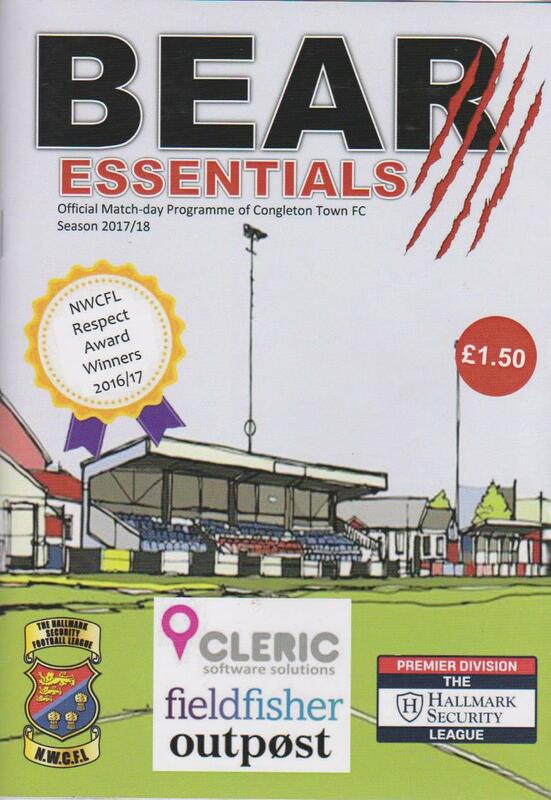 I'd really fancied doing Congleton Town for ages. 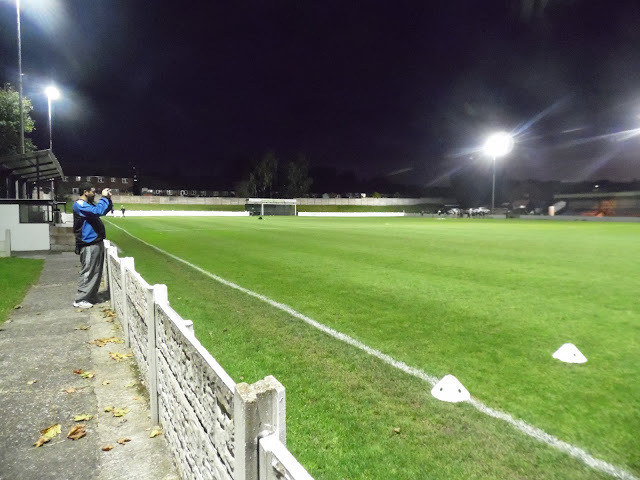 I'd even attempted going to a game back in February 2016 when they played West Didsbury & Chorlton, but the game was called off in the afternoon, due to a waterlogged pitch. 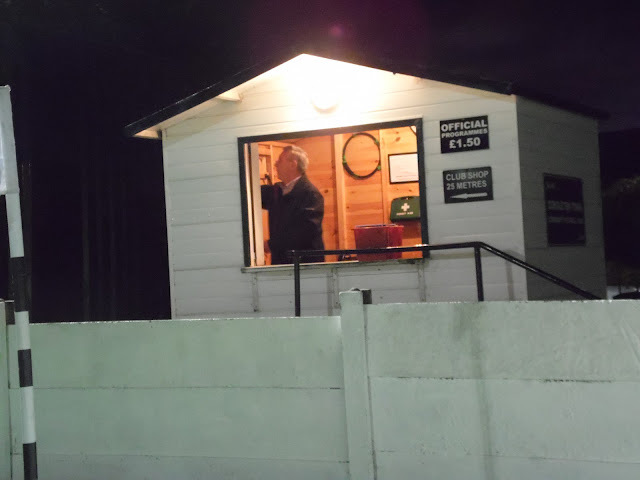 I ended up going to Ollerton Town, with fellow groundhopper Chris instead, as it was one of the few games on that day. I suffered a double whammy that day, as well as missing out on my preferred choice of game, a fox also ran out in front of me on the way home on a dual carriageway, meaning an expensive repair bill and insurance claim. I didn't think Anwar would go for it, but to my delight and surprise, he agreed to accompany me to the game. He'd even arranged to meet me at his work, saving us leaving at our usual time of 4 and chance of pre-match being ruined due to traffic. I started doing my research as to where to eat and drink and also if there was anywhere to stop, should we need to kill time. On the day of the game, I had a better night's sleep than the previous few nights, getting 7 hours in and waking up at 7 am. After catching up on Twitter in bed, I went downstairs and had some eggy bread for breakfast. After getting ready, I walked down town before getting a lift back with my Dad. After a microwaved kebab and can of Irn Bru for lunch, I left to meet Anwar at 12.40. I got there at 1.20 and found him being chatted up by a couple of crazy old women who worked at the same school as him. We were soon on our way, listening to Jeremy Vine on the way up. We'd decided to stop en route, choosing Stafford as the destination as it was fairly near the motorway. I also thought I'd grab some pictures of Stafford Town on the way. However, when I got to the ground, it was well secured, with no chance of getting in. I didn't even bother getting out of the car, in the end, instead driving to Stafford ASDA to get petrol. I discovered my phone was nearly dead and so with us under an hour from Congleton and the time being 3.45, I paid a quid for an hours parking. I noticed on the way up that my phone's battery was low. I pinned down the fault to a dodgy USB cable, so the priority was to replace it. Before I did that though, Anwar continued his knack for being accosted my middle-aged women and I was roped in too. Fortunately, it was all innocent and it turned out to be some ladies doing market research for Mars. What was sold to us as 'a quick five minutes' turned into 20 minutes. It wasn't all bad, we got to try a new concept Twix chocolate bar. There were two versions and much to the ladies disappointment, we both preferred the second type, whereas they preferred the first. I was a little miffed that Anwar's lady let him keep his chocolate, whereas mine took the bars back, for fear that I'd sell it to a rival company. We did get paid £3 each for our time though, for what was something pretty enjoyable to do. After that, we popped to Cash Converters, with Anwar picking up a computer game that he'd wanted for a while. Finally, I went to Poundland to get my USB cable, but not before checking that the connection fitted snugly. Thankfully, it did and so we made our way back to the car, arriving just before 5. I was glad that the USB cable solved my charging problems and it charged pretty quick on our journey north, with the traffic being very reasonable for rush hour. We got to Congleton at 5.45 and parked up in a street near the town. 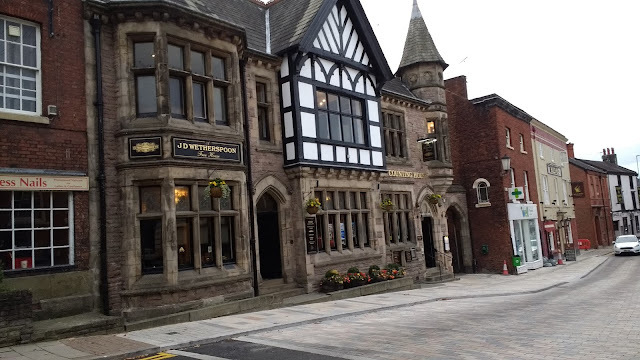 First stop was the local Wetherspoons, The Counting House, for dinner. Initially, I was going to have a steak and kidney pudding but with no real ciders on offer, I opted to get the meal deal - a mixed grill with Thatchers Gold for £7.99 which was pretty decent. From there I went in search of a cider produced in Congleton that I'd read about online. 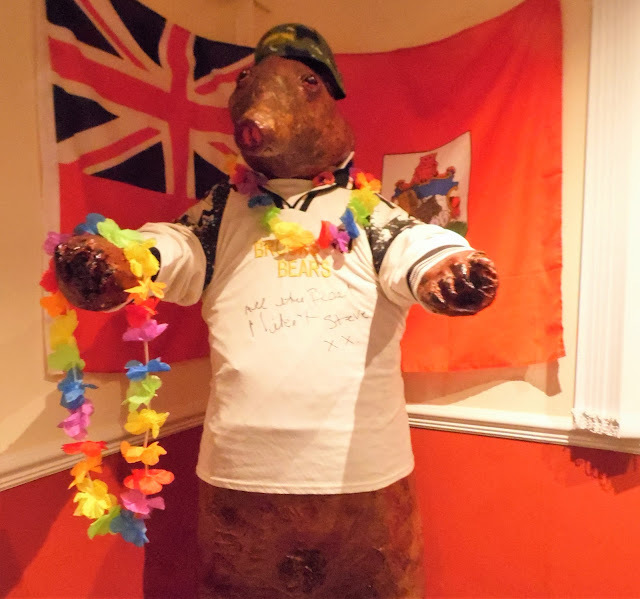 The Barley Hops and the Olde KIngs Head were supposed to have it, but although friendly, were unable to help. The other place that would possibly stock it, Bojangles Brasserie might have had it, but strangely for a restaurant, they closed at 6 and were too rude and ignorant to listen to my request to buy a couple of bottles to take home with me. With the time being 6.55, we decided to go to the ground. Entry was £6 and a decent programme at £1.50. I'd heard good things about the club shop and it was pretty decent with a fair few old programmes and a decent range of souvenirs. They were quite expensive though, with a basic pennant costing a fiver, but I was glad to help them out. 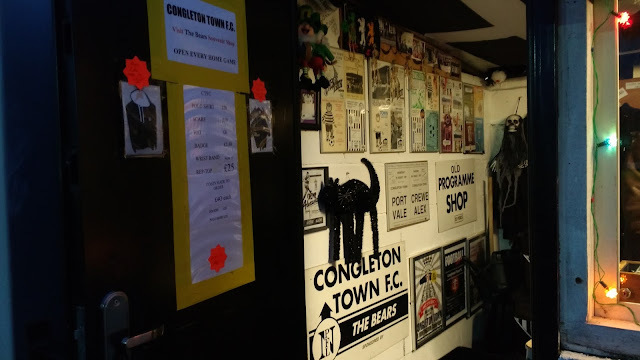 From there I went into the bar and although the Congleton cider still proved elusive, I did pick up a football book for a quid. From there I went around getting pictures of the ground. 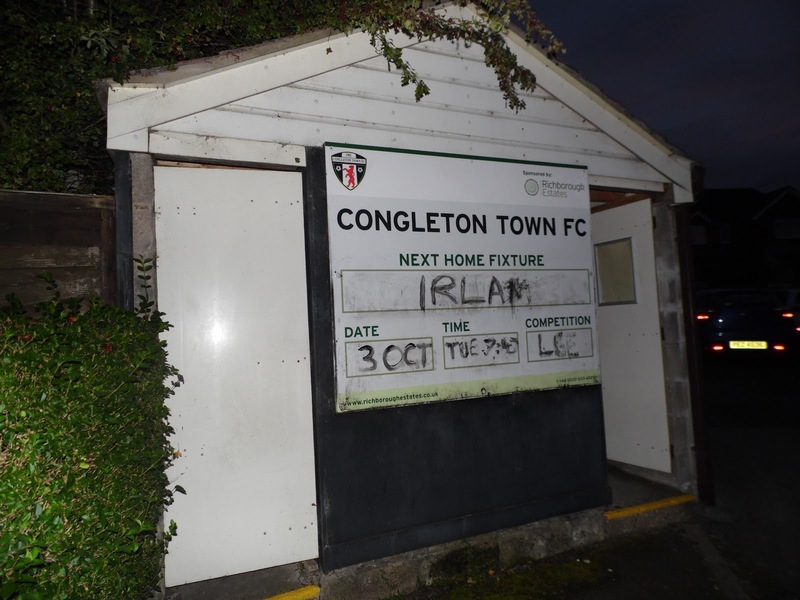 The Congleton Ultras were out in force, the youngsters enthusiastically brilliantly backing their team with some good noise all evening and questioning whether Irlam kept their romantic arrangements 'in the family' so to speak. 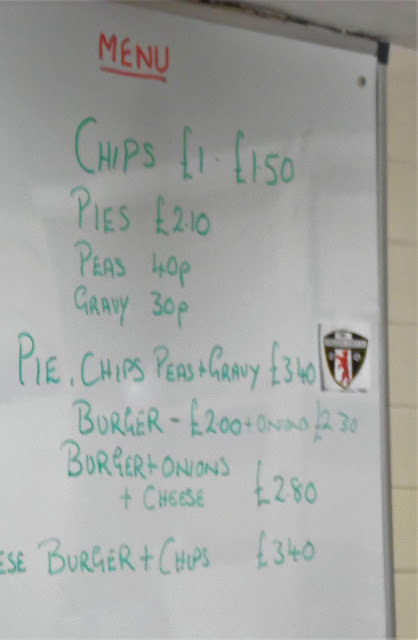 Later on, I'd get a Boril and some chips, which were both well priced at £1 each. There was one player on the Congleton teamsheet that I recognised. Jamie Tandy had had a varied career with local non-league clubs following being a trainee at Manchester City but is most well known for his eye being used as an ashtray by Joey Barton. There was a significant Merseyside contingent in the home side and they started well. They'd already hit the bar by the time they took the lead on the half-hour. William Hasler-Clegg crossed the ball from the right and Steve Foster blasted powerfully home from 6 yards. Seven minutes later, it was 2-0, Hasler-Clegg provided the cross again and this time Jason Carey slid home from close range. The second half started with Irlam trying to get back into the game but to no avail. A third on 57 minuted killed the game off and it was probably the best goal of the night, with Declan Fletcher's low shot clipping the left-hand post on its way in. Chances were less frequent from then on and the game petered out to its conclusion. We left at 9.40 after being thanked for coming which was nice. It was a decent journey home and although there were a plethora of roadworks, there were no serious delays. I dropped Anwar off at 12.20, getting in myself 25 minutes later. I stayed up for an hour or so, catching up online and watching Only Fools And Horses before going to sleep. BOOTH STREET was a ground that I originally visited on the 8th April 2008, prior to Wycombe's game at Macclesfield, hence the daytime pictures. What I saw then was a decent ground for the level and one that has earned excellent reviews since. 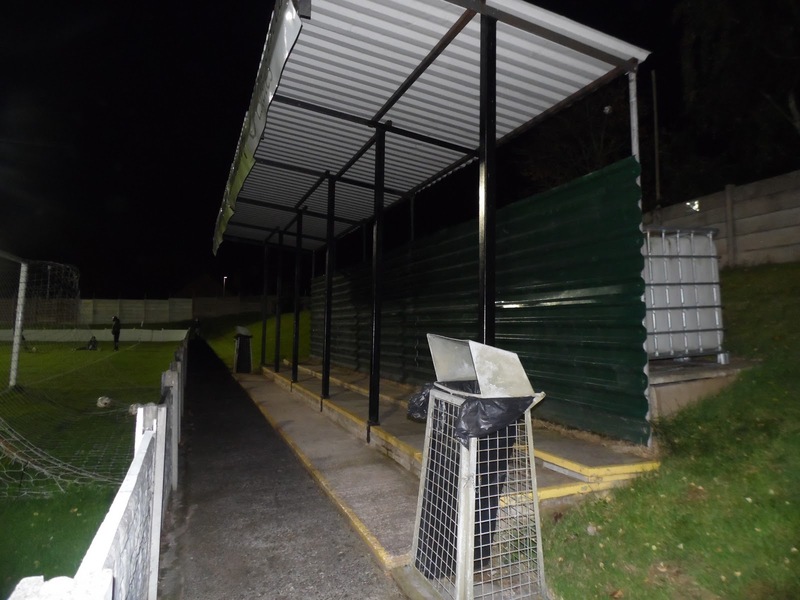 Upon my return, there had been a couple of additional areas of standing cover added. 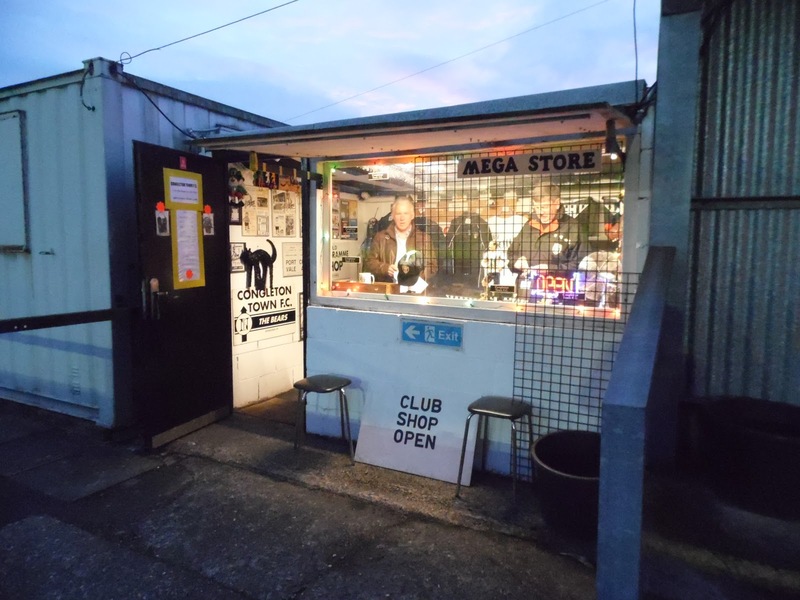 There was now cover on all 4 sides and in addition, I discovered that the tea bar and club shop were both decent. 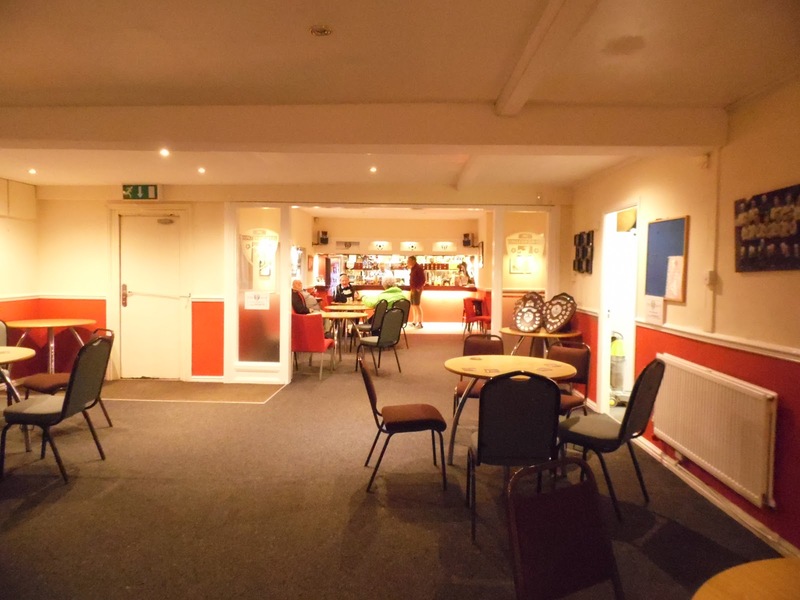 The bar was OK, not great on cider but spacious and welcoming and with local real ale. The town was also decent, with plenty of places to eat and drink.